Das Best Western Executive Hotel ist ideal in Richmond Stadtzentrum zu finden. Erleben Sie ein schöner Aufenthalt in der Nähe von alle Sehenswurdigkeiten. Bestpreisgarantie und exklusive Angebote. 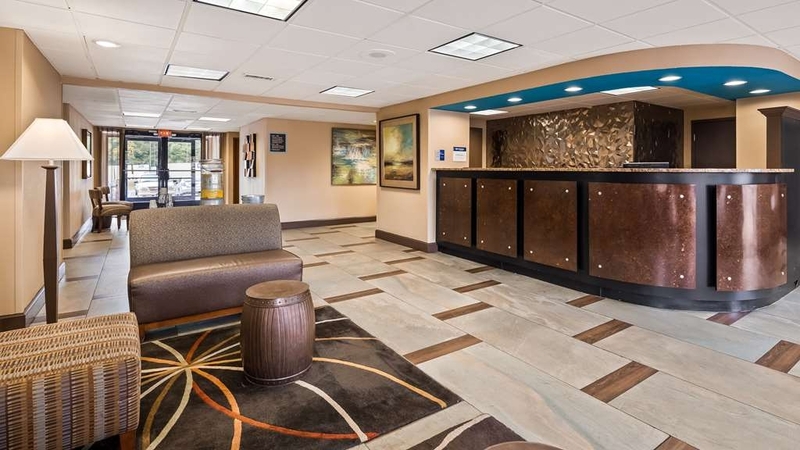 Willkommen im Best Western Executive Hotel!Innsbrook liegt in der Nähe dieses Hotels in Richmond, das sehr gern für längere Aufenthalte gebucht wird und bei Gästen beliebt ist, die zu Universitätsveranstaltungen in die Stadt kommen. Eine Unterkunft in der Nähe der University of Richmond bedeutet, dass Sportveranstaltungen oder besondere Events wie Abschlussfeiern in kurzer Zeit erreicht werden können. Auch Besucher von Studierenden und Dozenten haben es nicht weit bis zum Campus. Dank der günstigen Lage an der Broad Street sind Restaurants und Geschäfte zu Fuß erreichbar. Zu einem guten Hotel gehört jedoch mehr als nur eine gute Lage. Freundliches Personal und konkurrenzfähige Preise sind ebenso wichtig. Auch das HCA Hospital ist nur eine kurze Autofahrt entfernt. Medizinisches Personal und Verwandte und Freunde, die Kranke besuchen, haben es daher ebenfalls nicht weit. Tatsächlich sind es die gute Anbindung an die Interstate und die günstige Lage in der Nähe von Restaurants und Unternehmen, die dieses Hotel in Richmond so populär machen. Die Nähe zu Universitäten, darunter VCU, U of R, VUU und JSR, bedeutet, dass wir auf längere Aufenthalte spezialisiert sind. Wir beherbergen gern Dozenten, die ein Zuhause für ein Semester benötigen. Ganz gleich, ob Sie sich Little-League-Spiele oder ein Lacrosse-Spiel anschauen, der Aufenthalt im richtigen Hotel kann für den Erfolg Ihrer Reise entscheidend sein. Sport gehört hier zum Leben dazu. Das gilt für Fußball-Fans und Fans des Baseball-Teams der Flying Squirrels gleichermaßen. Wir bieten außerdem einen preiswerten Tagungsraum, der sich perfekt für kleine Geschäftstreffen eignet. Auch Mitarbeiter von Dominion Power, Altria und anderen großen Unternehmen buchen in unserem Hotel in Richmond. Gäste,die geschäftlich bei CSX Railroad zu tun haben oder zu einer jährlichen Tagung bei Siemens anreisen, können hier Arbeit und Vergnügen mühelos miteinander verbinden. Der Lewis Ginter Botanical Garden liegt in der Nähe, und auf dem James River bieten sich Möglichkeiten zum Rafting. Die NASCAR-Rennen auf dem Richmond International Raceway sind ebenfalls ein großer Publikumsmagnet, und nichts geht über ein Fußballspiel der Kickers Richmond. Beginnen Sie noch heute mit der Planung Ihres Aufenthalts im Best Western Executive Hotel! Wir wünschen einen schönen Aufenthalt. When you enter an establishment the employees should make you feel that they want you to stay in their hotel. That was not the case, the front desk manager on 29 March at 1:30 did not do that. We got to the hotel early coming from South Carolina, He was very unprofessional in telling us that the rooms were not available yet which is understandable, but it should be done in a way that the customer should not feel as if it is a priviledge for them to spend the night there. He kept stressing the rooms would not be available until 3pm. When we came back at three he chose to service someone else prior to us. The staff on the other hand was most accommodating. They went out there way to ensure we had everything we needed or thought we needed. It is a shame when the employees conduct themselve more professional than the manager. Spent the night here before a friend's surgery at a nearby hospital. Clean, neat lobby, with available water, etc. for guests. Night personnel very friendly and helpful. Room was clean and had no odor whatsoever. Bathroom was pristine! Beds were comfortable, with clean, fresh linens. Didn't get to have breakfast because we had to be at the hospital too early the next morning, but breakfast looked and smelled delicious. Food appeared to be freshly prepared and options were generous. (Perhaps having some type of take-out container would allow those who have to leave early to take a little something with them.) All in all, a night--and money--well-spent, and I won't hesitate to stay here again the next time I'm in Richmond overnight! Great job, everyone! Hotel was conveniently located off I-64. Hotel was clean and the staff was friendly and helpful. The breakfast selection was more extensive than other hotels and the area was well maintained. If you don't want to go too far for other meals, there is a Fridays restaurant across the parking lot. There were plenty of free parking spaces. Enjoyable stay...I would definitely stay there again. We stayed at this location for three nights using Rewards Points. The front desk staff were awesome. When we checked in, we were greeted by Selena. We even had a greeting card waiting for us at check in. Selena was very nice and very helpful. She always had a smile. The room was clean and well stocked with towels, shampoo, etc. If I had any complaints, it would be that the bed was a little too firm for my taste. That may not really be a complaint, more of a preference. We had the free breakfast buffet each morning. It was actually pretty good. Offered real sausage, bacon, biscuits and sausage gravy, scrambled eggs, waffle maker, fruit, etc. Again, thank you Selena for being so kind! "Not Bad for my 8 hour I was there." hotel was clean and quiet upon checkin. breakfast was hot and had a decent selection. And staff at front desk was very friendly. Room was clean and had the must haves TV, Fridge/freezer and microwave. I chose this facility as it was close to a venue where I was giving a talk that evening, and didn't want to drive after the talk. check in and out were quick. Lots of nearby places to eat. Room was comfortable, the breakfast was the typical. "One of the very best!!!" Staff was awesome, room was spotless, no noise at all and breakfast was great. his was my second stay at this location and it just keeps getting better. This location is very well located, easy o get into and out of. Great night of sleep in comfort. I was traveling with my parents to a southern destination. This hotel stop was convenient in all aspects, location, price, customer service, cleanliness etc. We would stay here again. Didnt have a good night sleep, because of noise and other guest smoking outside my door. I went out to see what was going on and a guy scared me back to my room. I was then afraid to call front desk because they saw me. I am not sure if this a common practice but my night was a nightmare! I checked out as soon as i could in the morning. The staff were amazing. The breakfast lady greted everyone to breakfast. "Best Western Thanks For Great 24th Annivesary Stay"
We stayed at Best Western March 1st to March 4th, 2019. It was our 24th Annivesary. The staff is always helpful and courteous. Everything is clean and well-maintained. Great mattress. Fantastic water-pressure in the shower. Great place to stay. All employees were wonderful. Amazing few days!! I had a great time at the hotel. Staff were polite and the rate was great. I will be recommending this hotel to all m6 family and friends to stay at Best Western. I started using it about 2 years now and I love it. "Serviceable hotel, close to U Richmond"
Easy access off I 64. Short drive to U Richmond. TGIFridays on the property and tons of other food options nearby. Sheetz gas and convenience adjacent for your alcohol and snack needs :). Rooms are basic but clean. Amazing shower water pressure. Mini fridge and microwave work well. Front desk helpful and efficient. Exercise room is great and the breakfast is high average for a place like this. Only complaint is that a hall smoke detector needed a batter and nobody attended to it so it chirped all night. Super annoying. Clean, comfortable, convenient. No hassle check-in & check-out. Breakfast area has plenty of food and good service keeping it stocked and clean. Housekeeping is very good. Quiet for a hotel close to major traffic. Bynum Road entrance is tricky at night. No street sign. Turn before the Best Western sign. It's easier to come in behind the Sheetz. Left off Emerywood Parkway. I found it pathetic and inconvenient that this modern hotel with 4 floors does not have luggage carts for its guests. Lugginhg a lot of luggage up and down the elevator at check in and check out made this a mediocre experience. The staff did not seem to care one bit. I plan to stay at a different hotel next time I am in the area. Very nice property, convenient location, reasonably priced, great amenities and stylish decor. Don't miss this lodging when in Richmond. Had a reasonably spacious room with an operational coffeemaker, can't beat that! We always stay here when passing through on our annual trip to the Outer Banks, and we are never disappointed. Check in was easy, and everyone was very friendly. The hotel is always quiet, and we are there on a Friday night. The room is clean, bed is comfortable. Wifi works great and is free! Had plenty of hot water, and nice flow of water for taking a shower. The shower and commode are in a separate room, with the sink outside of that room. Makes it easier to get ready for the day, so someone else can be showering in the separate bathroom. Breakfast is the usual food with real eggs, bacon, biscuits and gravy, waffles, fresh fruit, yogurt, etc. The employee in the breakfast area, did a great job, keeping everything clean and filled up. Check out was quick and easy. There is a restaurant within walking distance from the hotel. They will give you a 10% discount if you show your hotel key. Will be back next year! The Executive Hotel by Best Western offered very clean and comfortable accomodations for a couple of busy days. It is fairly well located for visiting the Richmond area and there are conveniently located shops and restaurants in the immediate area. The bed was quite comfortable; the linens were above average for accomodations in this price range. Hotel personnel were friendly and helpful. There is a substantial breakfast buffet included in the room charge that offers a hot and cold menu until 10:00 a.m. (as of this posting). We found the breakfast to be quite adequate to fuel us for most of the day. "Not sure why we decided on a 2nd try!" Guess I didn't remember staying here before. If I had we would never have come back. People at front desk have no personality. Asked twice for 2nd ashtray...never received one. Asked twice for Do Not Disturb sign...never received one. The pillows were like small square marshmallows. We had to go out the next day and buy 2 pillows so we could get some sleep. Got locked out of our room one day...went downstairs for a new key. Girl at desk didn't say a word...just took the key and handed us a new one. Guess somethings never change. Poor example of a Best Western. "This is not a 3 star hotel "
I saw 3 star rating, next ti Embassy Suites, and jumped on it. Stayed 2 nights for business and wish I hadn't. A/C was not working. Even though they were going to replace immediately, I had to request a room change which I did receive. Breakfast was unappetizing. Rooms needed updating (desperate need of new flooring). Maybe a 2 * rating at most. The staff was extra friendly at this hotel and I have to admit I was very pleased with the cleanliness of the rooms. We visited this hotel with my teenager and his volleyball team. The staff treated the kids very well and the breakfast buffet was on point. They also let us use the breakfast room in the evening to get all the kids together for a pizza dinner. Location: very easy to get to; right off of I-64. Nice, safe area, not "Richmond proper", less than 6 miles from downtown Short Pump (our actual travel destination). Next door to a Sheetz and TGI Fridays. Amenities: fast, free wi-fi and the best complimentary breakfast spread I've ever seen at a hotel (waffles with whipped cream as an available topping, eggs with various toppings to make scrambled omelets and also tortilla shells if you wanted a breakfast burrito, sausage links and patties, perfectly cooked bacon, biscuits, gravy, toast & bagels with butter/cream cheese/jellies, yogurt, fresh fruit, various cereals, milk, OJ, apple juice, and fruit punch). Also free parking! The room was spacious, clean, in good repair, and comfortable. The shower had amazing water pressure and an abundance of hot water, and the shower head was adjustable (this is a big thing for me, because I'm tall and do not like not being able to adjust where the spray lands). We had two double beds, and each bed had three pillows. Maybe I've just been staying at the wrong hotels, but I'm used to only having two and brought one from home! The hotel was also quiet, and the staff we interacted with was super friendly, helpful, and professional. I seriously cannot recommend this property highly enough. We will definitely be staying here again, any time we have business or pleasure in the greater Richmond area! This was our second time staying at this location. I was pleased with the hotel. The room was spacious and comfortable. My daughter enjoyed the swimming pool as well. The breakfast was also good. I would recommend staying here again. Above and beyond expectations. One thing I was a little torqued about. I am assuming the 2 adults that came to the pool w/4 kiddies had no intention of staying @ the pool w/ them. This occurred just as my wife and me were planning to jump in. We packed up and went back to the room. We gazed outside the window 20 minutes later and the kiddies were still un-attended. But other wise everything was fantastic.We would have definitely stayed 2 more nights if we had the time. This is a nice hotel in a great location. Staff is very nice and attentive to needs. Edward at the front desk was very friendly and helpful. Cleaning staff was very nice and friendly as well. Rooms are clean. Did not use the pool but saw others in it. Had a great stay and would definitely recommend this hotel. "SERVICE AND CARE BY THE STAFF." check in was five star. (EDWARD ) at the front desk was top of the line. answerd all my questions ,even gave me information that i needed and did,nt ask for. The housekeeping was great,the breakfast was top shelf, i don,t want to seem over excited about my stay, but i am. Thanks to ( EDWARD ) @ the front desk who started me to become comfortable. Stayed here for five nights. Reasonable priced and good location. Never had the shampoo replaced in our room after asking numerous times. Had a non working coffee machine for two days after asking for a replacement each day. Finally got one after third request and had to get it from the front desk. Never received replacement coffee. One day room was never cleaned , don't think housekeeping even came in that day. We left the room at 10am. Did make all this known to front desk. "Good Enough - No Problems"
Although the location is a bit hard to find, even after you spot the hotel, the stay was alright. The staff was nice. The property and rooms were clean. Breakfast was the standard fare, not exciting but decent enough. We would stay there again. Room were very clean. Beds were very soft. Edward at the front desk was so kind and helpful. He was trying to get our room cleaned so we could check in early. Cleaning staff was helpful with the little extras we needed. Great location to eat. Will be staying there again in the future. "Very Nice for the price!" Stayed here for Memorial weekend, my hotel room was super clean and the breakfast stations were great (you can make your own Waffles!) I would definitely be staying here again. The prices are very affordable (please keep the affordable prices). Also, Edward(?) at the front desk was wonderful! We were there to participate at the Virginia Senior Games 3-on-3 Basketball Tournament. Result was a Silver Medal in the 70-74 age group and a qualification for the National Senior Games next year in Albuquerque, NM. The hotel room was clean and well stocked with towels and other items. When I realized I forgot my toothbrush and toothpaste the front desk was able to quickly help. The breakfast in the morning was far better than any I've encountered in many years for a free breakfast. The food selection was excellent and more than you will find elsewhere. If we ever happen to return to the area we will definitely be back to this facility. 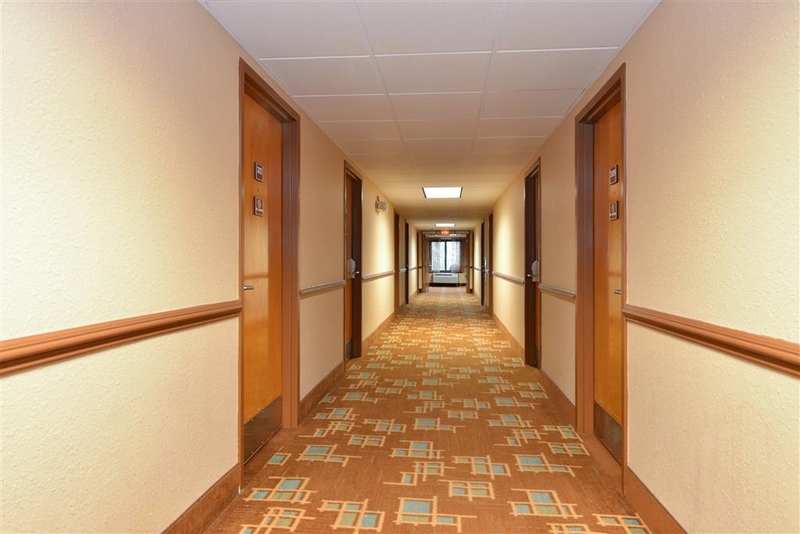 The hotel is convenient to interstate as well as local amenities. There are a host of restaurants and shopping centers within close proximity to the hotel. The staff was welcoming and the facility was clean. Difficult to find but worth the effort. Suggest looking at google maps (street view) prior to arrival for easy access to parking lot. Staff was great. Bed very comfortable. Breakfast area small - suggest arrive when opens or wait 30 minutes prior to close. We stayed three nights visiting sites in the area. Hotel was very quiet. Better than average breakfast. Good location fairly close to several restaurants, Walmart. WiFi worked well. Room was comfortable. 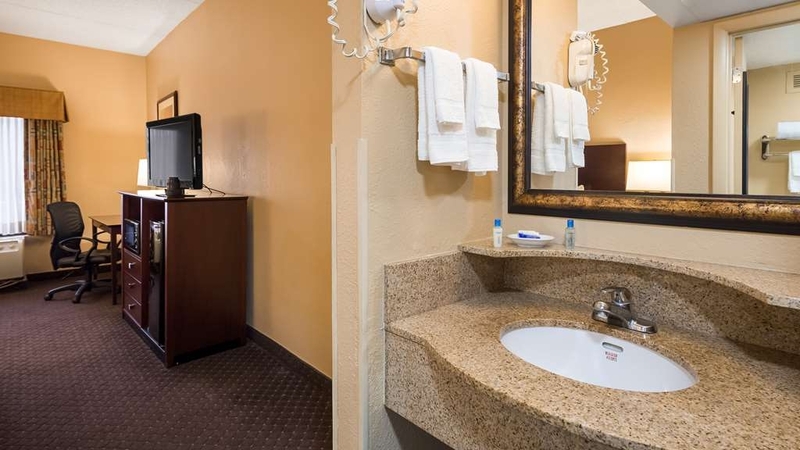 Sink is located outside the room with the shower and toilet. Would definitely stay again. TGI Friday's next door. This hotel is located just north of Richmond center just off the I-64 exit. I was visiting a cousin that was in the UVA Medical Center. Traveling back and forth was a breeze. The staff were all very helpful and friendly. If your heading to Richmond and need a location with good access to downtown, try this hotel. This was an excellent stay at a great hotel facility. The hotel was very handy to area attractions and a good selection of restaurants. The Staff at the Best Western, both evening and morning, were awesome. "Fine for a night. No complaints." This place was fine, and I don't mean that in a negative way. We've stayed in 5 hotels in the last 3 weeks so it's hard not to compare them all to this one. We were in town to tour the University of Richmond and needed a nice hotel with clean rooms and showers. The Best Western Executive Hotel was exactly what we needed. Nothing fancy but fine. People at the front desk were all very nice and the free breakfast was your typical "free hotel breakfast". There's always something you can find that you like (I like the waffles, personally). The breakfast room itself was a bit claustrophobic but overall, just fine for what we needed and the price was very reasonable. Restaurants are nearby so that was a plus. "Nice property in good location"
I arrived very late but was greeted warmly by the staff. The accommodations were spacious and well-kept. Although the hotel is on a main road, it is set back from the street and was quiet, with on-site parking. "overnight stay for next morning training"
All staff were extremely helpful and provided excellent customer service. Room was clean and very comfortable. Next morning ;s breakfast offerings were great! Would highly recommend to anyone that are scheduling for short stays. We were very satisfied with our experience. The room was clean, everything worked well, quiet, and comfortable. The staff were friendly and helpful. The free breakfast was hot and plentiful (though the tables in the small room were awkwardly arranged). It's a good location, right next to I-64 (though you don't realize you are that close)—note, though, that the entry from Broad Street to the motel is hard to find, and if you miss it you have to drive quite a ways to turn around). And the price was quite reasonable. We stayed here for race weekend for Richmond, and the hotel staff was very nice and helpful to anything we asked. Breakfast was very good and the room was nice and clean. Check out was done in a timely manor and over all it was a pleasant stay. "UR visitor - great spot!" I needed a place to stay before visiting the University of Richmond and several other area hotels were 3 to 4 times the price and some didn't even offer breakfast! If you need a clean, comfortable room in Richmond, I recommend this location! super clean, new mattress, quiet and modest price; if you want a 4 star hotel you will not get it at this price; for this very modest price you receive a very clean well maintained room, all the towels you may need, and a breakfast; we have also stayed nearby at triple the cost and the breakfast here is comparable to the 3 star hotels- some fresh fruit, various breads, oatmeal instant and hot, waffle, fresh scrambled eggs, yogurt-ok , butter or margarine- If you want a restaurant several nearby; We wanted a fresh bed in a very clean room with a well maintained bathroom and got it for a modest fee; French tourists staying here say it is recommended above nearby 3-4 star hotels in Paris, for the reasons I mention. Safe parking too.We liked the coffee. 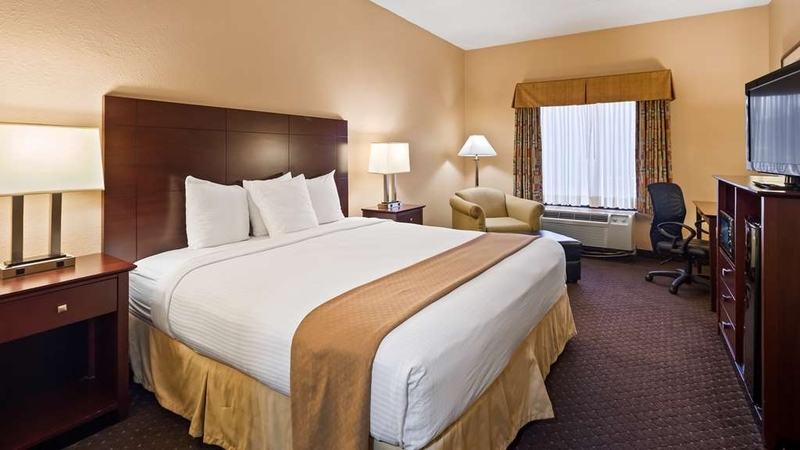 Our room was clean and comfortable and the staff was friendly and helpful. It was a typical BW breakfast, meaning very average. All the food was edible, but those artificial or freeze-dried or whatever eggs are kinda just tolerable. The exercise room included a weight machine—a nice touch. Nice restaurant (Friday's, I think) within a couple hundred feet of the front door. All in all, a good place to stay and a good price. "Great Room | Loud Neighbors"
Check-in was quick and easy. The staff was nice, professional, and helpful. The room and lobby were clean. Our only issue was that the guests in the room next to ours were loud. They quieted down around 10:00 pm so it didn't disrupt our sleep, and I know it isn't Best Western's fault they were loud. I would still recommend it. Nothing special about this Best Western. Though it has "Executive" in its title, it is quite mediocre and really not suited for any executive. The room was small, furniture was dated and the sink was not in the bathroom but outside, in sight of the beds. Hard to brush your teeth when others are asleep. The amenities were spartan. Beds and sheets were passable but barely. There was a free breakfast and it was OK, - scrambled eggs, cut up hotdogs, waffles, yogurt, juices and tiny muffins. It filled you up. The hotel is not very visible from West Broad Street and easily missed (even w/ GPS). There is a TGI Fridays about 100 meters away and a BBQ place across the busy W Broad Street. The rates were not that expensive. It is average, at best. I had been upgraded to what was called a suite, to accommodate what appeared to be some sort of school gathering.They need bed space.The furniture was old and very dirty,I came in at 9:55 pm to find kids play touch football outside in the hallway. We have stopped at this hotel for many years on our way to Florida. We appreciate the location, service and amenities offered. It is close to the highway, near restaurants and provides a good breakfast variety. The stay was very excellent. The customer service was excellent. Would diffently stay again.The general manager made sure we was very happy. We had other family members come down for a family members funeral and they truly enjoyed their stay as well. Visited on a trip to see Civil War history and this was a nice place to stay. It was very convenient to the sites we wanted to see. Staff was very friendly and the room was nice and clean. Beds were very comfortable. Would suggest this hotel to anyone. I stay here all the time when I visit VA. I was surprised this time to find roaches in my room and no bacon in the morning! We were moved to a bigger and better room and the other room was treated. We also received a nice discount for understanding. Thank you and I will stay again. Stayed three nights during Thanksgiving. Room was decent, clean and economical. The staff was great and very polite. Area had a few restaurants close by. Morning coffee and flavored creamers was a nice touch. The family and I enjoyed our brief stay. Check-in was slow, due to trying to take advantage of a discount. The room was clean and comfortable with nice furnishings. It was often difficult accessing the Internet from the room so I turned off WiFi on my phone to use the carrier's bandwidth. Breakfast was good except the sausage was overcooked (it as fine during our previous stays). Checkout was pleasant and rapid. Average hotel ! I am gluten free and no healthy options except the eggs which tasted like powdered eggs, sausage dried out! I had digestive issues after! Hotel stafff was great, rooms updated and clean. This was a nice place to stay for a quick weekend get away. I appreciate the Staff's assistance and making themselves available for my concerns. I will surely stay there again. One of the nice places to stay in Richmond, VA.
We received great service. Staff there were very friendly and helpful. We got a good night sleep at a fairly reasonable price. When we are traveling through this area again we will stay at this hotel. We would recommend this to others. I stopped here overnight with a work group on our way through town. It was fine for a short stay but just know you are getting really the basics. The hotel needs a refresh on the outside (doesn't impact the stay) and the bathroom area was really old. Overall, it was fine and will serve your basic needs--a door to lock, a bed to sleep on and a bathroom. It was all clean in a basic way but the whole place needs a deeeep cleaning. "It's ok for a night"
Hotel is just ok, I wish it was cleaner and more updated. Location is perfect, right on broad street. If the hotel was better taken care of I would stay here more often. I usually pick one of the Innsbruck hotels because they are just more updated. Great location but bathroom was small. Definitely had to like the person you stayed with if applicable. Wi-fi worked seamlessly in hotel. Breakfast had real food so no need to stop off for Waffle House or Aunt Sarah's. Even had breakfast burrittos. Good Value. Staff helpful, The room was clean, bed comfortable. Breakfast was good and the lady taking care of items made sure the guests found items they were looking for. I would use this facility again if in the area. After being on the road for 10.5 hours, our bed and room was a very welcome sight. Check in went quickly and we were on our way. Only one elevator was operating, so had a couple long waits while we were there. They were quite busy, so am glad that we made our reservation in advance. Room was clean and had requested a quiet room away from elevators and vending area. They honored my request, so we had a nice quiet night of rest. Bathroom is small, but the sink and vanity is outside of the bathroom, so makes it easy for someone to be using that area, while someone else is using shower/bathroom. TV and wifi worked great. TGIFs is within walking distance of the hotel, and they will give you a discount if one shows your hotel key. Breakfast area is quite small, so it was hard to maneuver around the tables and chairs, especially when it was very busy. I noticed some people were taking their breakfast back to their rooms, as there were no tables available for seating. They did keep everything filled up, and never ran out of anything. We will definitely stay here again if in the area. Living about 9hrs away I decided to stay the weeknd (10/13-10/15) after being on the road for 10hrs all I wanted to do was get to the hotel and just relax and be out of the car. Check in was simple (booked third party). Robert was at the front desk he was really friendly. When I got to the floor for my room, housekeeping was cleaning up rooms which is always a good sign. I was surprised how big the room was compared to other hotel rooms I've had for twice the price. The hotel was quite, you can't hear noise from other rooms.The bed was a little on the firm side and the bathroom is a little small. The room was clean, and upkept. My second night, I was looking for something new, Robert was working again, he asked me how my first day in town was going, told me about some good places to eat, and the best things to get. All the staff was extremely friendly, and was attentive. I will definitely be booking here again. This was a disaster, it was not clean, not enough tissue, worn out pillows, one shampoo. bedspread and bed shirt looked like someone had slept on them. the elevator was not working and the one that was working was not good and then not told it would be out of order. the room was very untidy, You could see finger marks on the table with lots of dust. and ask for a luggage rack they said they don't have them. it was not a good experience. We have stayed here twice this year. Very friendly people, clean rooms, good hot breakfast. The rooms are quiet. We will return. We visit family in Richmond and this is convenient for them. This is a good value for your money. Great value, Room and bathroom were very clean. Booked room several months in advance and it was quite the deal. Breakfast had lot's of options. Waffles, eggs, sausage, breads, bagels, biscuits, cereals, fruits juices, yogurt, muffins Staff was friendly. It is a very nice hotel. I stayed two nights. Had no issues except I had to take the stairs a few times because one side of the elevator was not working and being worked on. But other than that I have no complaints. I wished that they would have included grits in their breakfast layout. But that's just a personal thang. It was relaxing and enjoyable. "There are many other places to stay in this area"
This hotel sits at the low end of the Best Western spectrum. Still free wifi and breakfast which is great, but many things that offset this. Broken elevators (one being replaced, the other you often had to call downstairs to get them to send it up to your floor), and no working printer in the business center. That was also not fixed during my stay even though I asked them about it. Rough stay for me, with so many hotels in this area, you may want to look elsewhere. "Great staff make all the difference"
Room rate was reasonable especially for the area. The gentleman who checked us in was awesome, but I can't remember his name. Very jovial and helpful. Room was clean, we had wifi, there was hot breakfast in the morning and coffee was available all day. We really just needed a place to crash but there was a great bbq across the way, (mission) and there is shopping and several thrift stores very close by. Krispy Creme is only a couple of miles away and we found some great shopping nearby. "They are trying to make it better, but it's really not there yet." The building is old and need serious renovation exterior and interior. The room was clearly a former smoking room and still smelled of cigarettes, as was the "better" room they offered me. The bathroom and fixtures were a little newer and clean, as was the bed, thankfully, but the other furniture in the room and the curtains were very old and dirty. UGH. The carpet was passable, but not great. Breakfast is included, but many items were stale and the juice was watered down. The staff were very pleasant and helpful, though, as much as they could be. Great location, relatively clean rooms, OK breakfast, great caring efficient polite staff. Peaceful and relaxing. There is room for improvement, but my needs were met. You can tell they are really trying to satisfy their guests. I recommend. Room smelled like cigarettes, i had to clean the hangers before I could hang my clothes and the carpet was sticky. When I told the desk clerk about the hangers and asked if she had something I could clean then with - she handed me a wash cloth. 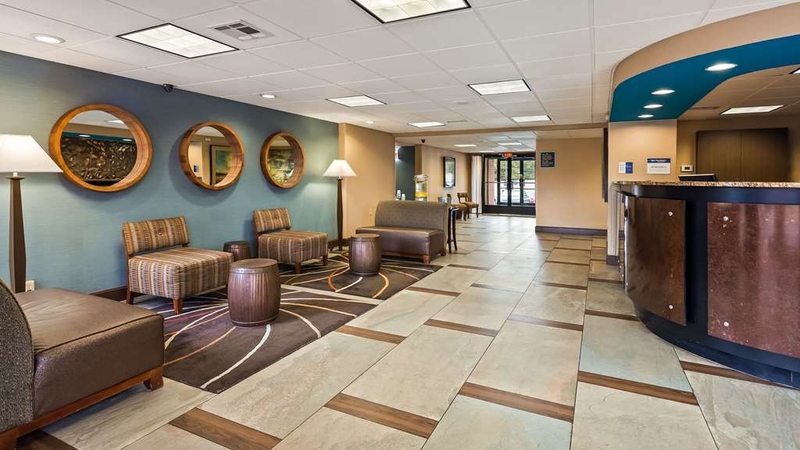 "My first week in Richmond"
Best Western offers the convenience of location coupled with breakfast and loyalty rewards. Minutes away from all of Richmond's opportunities, I avoid traffic and enjoyed various dinner options every day. This hotel is bad across the board. It's a dump. Outdated decor. Not clean. Sketch area. Staff suggested not going outside after dark. Thin walls. Tiny bathrooms. Tiny rooms. Breakfast not good. I would stay away. You would be better to stay at an old motel off of HWY 301 or Route 66. We had no problems at check-in even though they were quite busy. The front desk person, Nicole, handled everyone with quick efficiency. There were several individuals, like normal, that did not want to be in line or to wait their turn. Nicole handled all with a gentle manner and processed everyone as quickly as possible. I was only here to sleep for a few hours as i was traveling down to North Carolina. The bed was very comfortable. The only thing i didn't like about the hotel was the small bathroom. I would come back to stay at this hotel if i needed to stay for the night. "Don't think I will stay again"
From the beginning my reservation was messed up, booked 2 rooms double bed , no smoking. When checking in received two smoking rooms, Robert at the front desk did accommodate me with 2 king room with sofa beds. the sofa bed in my room had no linen, called downstairs to have bed made, housekeeper brought me linen to make the bed my self. The bathrooms are small and the pillows are not full size. was told I would received a discount for making my own bed, but I didn't received it. From the time I walked in, I was greeted with a smile, to the time I walked to my room a housekeeper smiled and said hi in the hallway to the breakfast attendant being so friendly the next morning.... incredible staff, i'll stay again!! I stay at the location often . Everything I stay at this location I am greeted with a caring warm smile . I have stayed at this location no less than 20 times and each time I am treated with the same can do attitude that makes me come back . "Its pretty good for the price!" I would give this hotel a 7 out of 10 for a rating! Its right on a main road for convenience for stores and restaurants! Very easy to access the highway! Could use an elevator upgrade though! Other then that not bad! Stayed with wife and daughter! I stayed at this hotel because I stayed at its sister hotel on previous occasions. However, that hotel was booked, so I tried this one. This hotel is very nice and the front desk staffs are extremely nice and helpful. I wanted to stay at a hotel that was reasonably fair in price, which this one was compared to the hotels (which were extremely much more in my eyes) right across the way from it. The only small nick picking thing that someone may have a problem with is that the bathroom is small. Otherwise, the hotel is very nice and the staff were just very helpful and nice. I plan to stay at this one or its sister hotel every time I visit Richmond. The place was very clean and smelled fresh. The staff was great. Super value for the money. It was a bit of a distance to city center (Richmond) but so worth it. I will stay here whenever I visit the city. All were hospitable, informative, professional, and knowledgeable. Thanks, I enjoyed my stay very much! Rooms very clean and roomy. We received complimentary cookies and coffee in the lobby. Breakfast was great as well,with much variety. This hotel is a little tired and worn.However the Staff especially Michelle really put them selves out to help guests.The breakfast room is a tad small but the breakfasts on offer are okay.You do require a car if you want to stay here,if your just staying overnight there are a few restaurants nearby ie TG Fridays and The Mission across the other side of the dual carriageway.A petrol station named Sheetz also is a five minute walk and sells all kinds of foods.We arrived early round noontime but Michelle found us a room so we could check in immediately.The hotel was full due to Graduation ceremonies but everyone seemed to enjoy their stay. Staff are unprofessional and appear to be on drugs. Will not stay there again in the future. One of the staff appeared to be ill in the elevator and was taken back that I was even talking to her as she was about to pass out! Rooms were nice and clean and fresh. I really liked swimming pool was open and opened 24 hours. so was the fitness room.The breakfast was really good. Only issue is the public bathroom was less than ideal. This was the most enjoyable stay. The junior suite was worth every penny and the staff was amazing even with my odd request. I recommend this place if you are in the area. My only wish is that they had an indoor pool to top off this experience. Hotel was easy to find, even in a big city, and very convenient to downtown Richmond to visit. Front desk helpful, breakfast good and they honored our request to have a quiet room away from elevators. 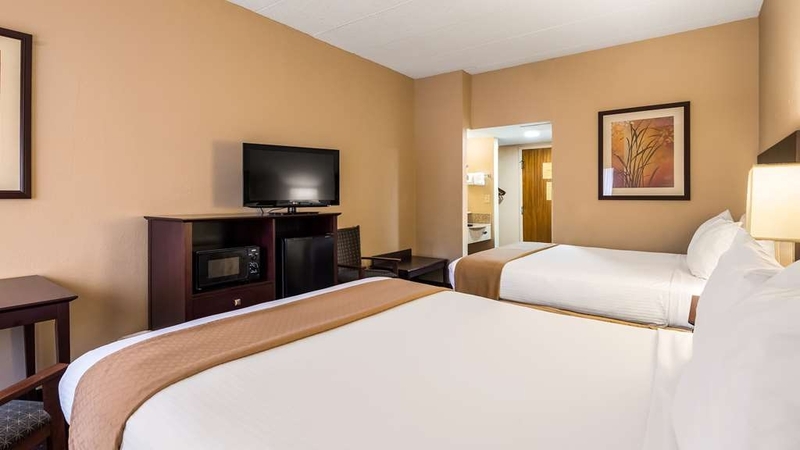 This hotel is not elegant but it is clean, well maintained, has comfortable beds, good breakfast buffet, 24-hour fitness room and is conveniently located to highway in a safe neighborhood. Great dollar value! The only major issue was that the room was not as clean as I expected. The staff were friendly and professional. Breakfast was good and there was enough of a variety to please everyone. The air conditioner was noisy and I could not seam to find a comfortable setting for us. The beds were very comfortable over all a good stay for the value. We stayed for a night , changed from two, while attending a sports event at the Sorts Backers Stadium. Location was good and easy 10 minutes away from stadium. Nothing fancy here but book direct. They do not like dealing with booking services. It was quiet, the beds were good, and the room was clean. Bathroom was very small with the vanity outside in the room and only tub/shower and toilet in bath, so old property. If you are looking for a place to sleep while attending something in Richmond it will work. They had a free breakfast which was not bad. "Smelly rooms and unfriendly staff"
I was here on business and was assigned a room that smelled terrible. Was charged $10 to switch to a room that was clean. Staff explained that there is a fee to make a change from your assigned room. You don't want to stay here, there are much better options around. "This one is a winner!!!" You will love your stay at this hotel. The location is excellent. Starbucks is about five blocks away and there are many restaurants near the hotel. The room was clean and spacious. The beds were very comfortable. The service was great and the staff was helpful and friendly. The breakfast choices were many and delicious. You will not go wrong by staying at this hotel. It's a great value. My stay was good until checkout on may 14th 2017. The lady at the front desk had a bad attitude, tdidn't speak, didn't give me eye contact. She was very impolite. The rooms were nice and clean. parking was good, the breakfast was also good. I would stay there again, for the exception of the lady at the desk on the 14th. All the other staff members were excellent. "I would not recommend this hotel to my worst enemy!!!" I asked for non smoking room and was given a smoking section room. I was then told no non smoking rooms were available. The sheets were stained, the ice machine didn't work, and the cable went out for the tv an wasn't repaired until the next day. "Doctor appointment at st marys"
My stay was great. Had an appointment at st. Mary's very close. Breakfast was great. Stayed at this hotel back in February and will be staying here in the future, for future appointment. Staff was very help. I went down to Richmond to take photos of my daughter before graduation. I have stayed many times at this hotel and have had a good stay each time. I would recommend the place to all types of travelers. Hotel over all was decent. I had an issue with confusion over a smoking room so double check hat your reserving a non smoking room. Offered breakfast which was not bad. Nice location near several restaurants and shopping areas. "Great value, good location, pleasant staff"
We stay here frequently when we visit our son in Richmond. The hotel is always clean and comfortable and the staff are both pleasant and helpful. The availability of a full laundry room is a real plus. "Disappointed in condition of hotel"
Staff were friendly and personable, but hotel is in need of updating. Bed was hard and uncomfortable. My non-smoking room shared floor with smoking rooms which caused entire floor to reak of cigarette smoke. First of all I arrived at almost 5pm to be told my room was not ready. The girl at the front desk opened the eating area since we had food in hand to wait for our room. The so called manager mike I think was his name came down to talk to us. He was very rude and came at me like what was the problem. He was so rude giving attitude my husband got loud and said your not going to talk to my wife like that. So I after that he changed his attitude quick. He gave so many excuses and finally gave some points and discount on room. I stay here every month and since Susan has been gone the rooms are dirty the service is horrible. When I told him this he replied well Susan was so horrible and nasty to staff and that's why she wasn't there anymore. He just went on and on. I don't like the talking about employees and excuses that is not why I come here. So after this I will not be staying at this hotel in the future. I will be contacting the corporate office about this matter. Was looking for something in the area that wasn't too expensive,but yet not too cheap..This was perfect.. Great location and very clean and well maintained hotel...If I had anything negative about this hotel is that the rooms are small, But if just 1 or 2 people staying its plenty..
"2nd stay, won't stay again"
This was my second stay in this hotel. I chose it because its location was near my daughter, whom I was visiting, and the rates were not unreasonable. While my first stay was uneventful and the room each time was adequate and clean, I was unimpressed with the breakfast. Tasteless scrambled eggs weren't hot, and I noted only one serving utensil gor both the eggs and the sausage. As I don't eat meat, this made me unhappy. I had trouble connecting to the free wifi--turns out the hotel's service didn't like the browser on my phone, but the front desk couldn't help me and I waited on hold for tech support for a half-hour without ever getting a real person. I finally guessed at the solution and installed a different browser. I also had trouble with the business center--one computer wasn't connected to the network, and neither was connected to a printer. A business center should have working equipment. The bottom line is that I'm not likely to stay at this hotel again. Just stayed at the Best Western Executive Hotel in Richmond last night and what a wonderful surprise! Never stayed at a Best Western before, usually stay at Hiltons or Embassy Suites, although we have friends who do long car trips and they typically stay at these facilities and have always spoken highly of the chain. I read the reviews on this hotel *after* I had booked it since we figured we are really only spending one night so how bad could it be. We also discovered an Embassy Suites next door so we figured we could always cancel and check-in to the Embassy if the unfavorable reviews we read were true. From the moment we walked in being greeted by Leyda at the front desk who was charming and very professional, our concerns were immediately assuaged. The room was spotless, the bathroom was literally pristine, and even the continental breakfast was nicely done with an attendant that made sure the food was replenished with fresh offerings throughout our breakfast experience. I don't know why the reviews we read were so negative as our experience was absoultely enjoyable. I am a seasoned traveller (Hilton Diamond Level which means I travel quite a bit) who is very picky about where I stay. WIthout a doubt, I would stay at this hotel again and would highly recommend it to my friends. With employees like Leyda at the Reception Desk, how can you go wrong! Everything about this hotel is great from the people to the food to the room. You can't find a greater value in the area. It is my go-to place when I come to Richmond. The staff was very welcoming, the manager was extremely friendly. She even offered to share the hotel Thanksgiving dinner with myself and my husband. I love this hotel. It is always so clean and the customer service here is outstanding. Susan and her team are the best. They really treat you like family. This is the only hotel I stay at because it is so clean. The housekeeping here do a wonderful job. I enjoy talking and seeing Susan every time. I will continue to stay here every time because of Susan and her staff. There are quite a few cheaper options in the area but we picked Best Western as good reputation, and the breakfast. The standard room was great - big room, big bed, good shower. Breakfast was varied too - cereals, scrambled eggs, pastries, fruit and a waffle iron. So all in all good - the only issue was the 'new staff member' giving us the wrong room, meaning someone else tried to enter our room at half 11 prompting a phone call from reception after we'd gone to bed. The gentleman was then given the room next door. But that aside, hotel was good, location what we wanted and easy to find and park. The service I received at this hotel was excellent. When I first arrived I was greeted by Susan at the front desk. She looked for the reservation and then went to work to let us in the room. She inspected the set up to ensure we were happy with it. I needed to add coffee to the reservation and she was so efficient in making it happen with promptness. She came by later to check on us and continued to be very courteous!!!!! All of this happened in the midst of a very busy evening of patrons checking in. When leaving she thanked us for coming and gave us a discount for our meal at a nearby restaurant!!! We were invited to come again and we definitely plan to do just that!!! Thanks again to the meeting room planner for graciously assisting me with the initial request and the hotel manager for providing excellent service once we arrived. Very nice front desk woman named Chris greeted people with kindness and warmth. She was efficient and helpful, especially in directing folks where they could eat nearby and obtain a discount when showing their room key. The room was clean, no odd orders, with a love seat ~ a plus, imo. Would recommend this hotel. I arrived at the hotel very sick and Christina at the front desk helped me. She was my guardian angel that night and directed me to an Urgent Care facility, giving my husband exact directions to get me there quickly. I was treated quickly and courteously and now feel much better. Christina was a blessing to me that night and I wish to thank and commend her. 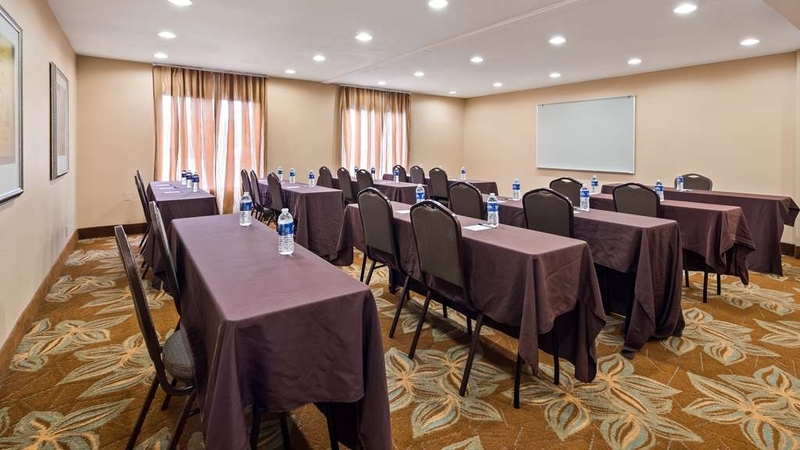 "Great staff, nice room, poor WiFi"
The hotel is conveniently located, just off I64 and it is easy to get to center-city and the northern Richmond area. The check-in was smooth and easy and the staff was very friendly and helpful. The room and breakfast were good, but it was nearly impossible to get a good WiFi connection. We ended up using our phones with the carrier instead of WiFi for Internet access. "Good hotel but internet connectivity is bad"
The rooms are nice, breakfast is fine (even though not very diverse), but served on cheap plasticware (boooh!). However, internet in my room (231) was next to nonfunctional (which may be different in different rooms). I asked for a quiet room which may be away from the Wifi modem, but such compromises are still not acceptable. "Very friendly and helpful staff"
My girlfriend and I visit Virginia very frequently to check on elderly family members in nearby cities. This visit was very different. Immediately upon entering the building we were greeted with a very genuine smile from Yashania. She was exceptionally pleasant and professional in our check-in process. Yashania made sure we were pleased with our room and answered any questions we had. She made sure we were informed of amenities, free breakfast, and local specials. Her level of service, the comfortable rooms and price, and the close proximity to local cities and shopping centers and restaurants are the reasons we will stay at this location again. Thank you Yashania Francis and all staff members who made our stay pleasant for your politeness and professionalism!! I expected a typical chain hotel with adequate accommodations & service. However, Richmond BW was above average in their breakfast buffet, front desk staff, comfortable room & bed & location to the Celtic Festival at the car racing site. They were next to a Friday's (even offered a 10% discount coupon) which was great since I wanted a nice dinner, but didn't want to drive anywhere. Lots of shopping centers/restaurants close by. 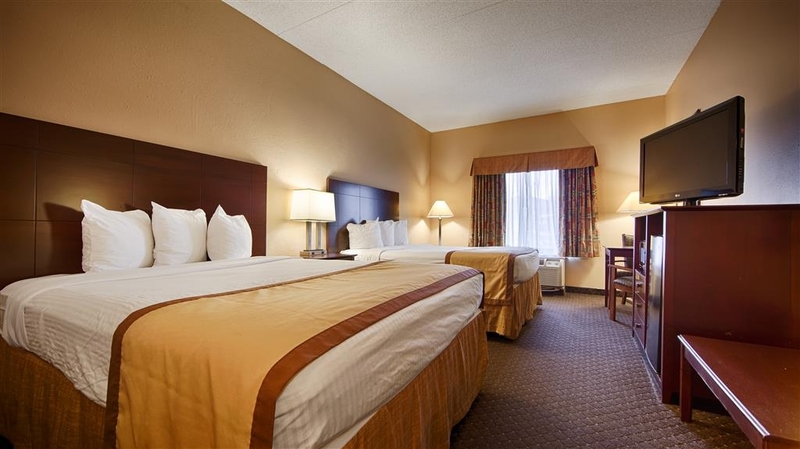 "Hotel experience at Best Western, Richmond, VA"
I highly recommend this hotel, cost was very reasonable and total experience absolutely wonderful! It was the best hotel stay we have ever had!! The room was comfortable, clean and well stocked with amenities. The continental breakfast bar was full of many foods, wraps, eggs both scrambled and hard boiled, pancake/waffles, many toppings, many beverages, yogurt and much more! And I'm a very picky eater and usually do not like most continental breakfasts. The hours breakfast was open longer than most. How can I say how pleased we were?? We will always stay there when in Richmond and now look for Best Westerns wherever we go nationwide. "I would stay here all of the time!" Everything was wonderful, the bed and pillows were very comfortable. Staff was very friendly and helpful at all times. The breakfast was so delicious with everything thing you could think of for breakfast. Made our reservation online. They were really busy, when we checked in. The gal behind the desk did a great job in handling everyone, and was so cheerful through all of it. Very pleasant and a great attitude. Our room and bed were both very clean and comfortable. The wifi worked great. Bathroom is a little small, but what I liked about it, was the sink was separate from it. Had great water pressure in the shower, and plenty of very hot water. Breakfast was the usual food; biscuits and gravy, waffles, scrambled and hard boiled eggs, sausage links which you could put in a wrap with the works; coffee, juices, yogurt. They kept everything very well stocked and the tables were all clean. Will definitely stay here again. I am in Richmond several days a week for work (most weeks) and have stayed at several mid-range hotels in the last two years. After staying at Best Western Executive Inn the first time, I haven't tried anywhere else. It's location is ideal for wherever one need's to go in Richmond and it's manager, Susan, and her staff are incredibly friendly, polite, professional, and accommodating. In spite of the misconceptions of other reviewers, smoking rooms are all on one floor. As a smoker who usually doesn't smoke indoors, I understand that there is going to be residual odor in smoking rooms. However, I tend to be very picky about cleanliness and after a year of staying here regularly, I have never found anything amiss. The housekeeping staff is very thorough and the rooms are spotless. Further, I had a friend who stayed in a non-smoking room for several nights and he rated it as the best mid-range hotel experience he had ever had. 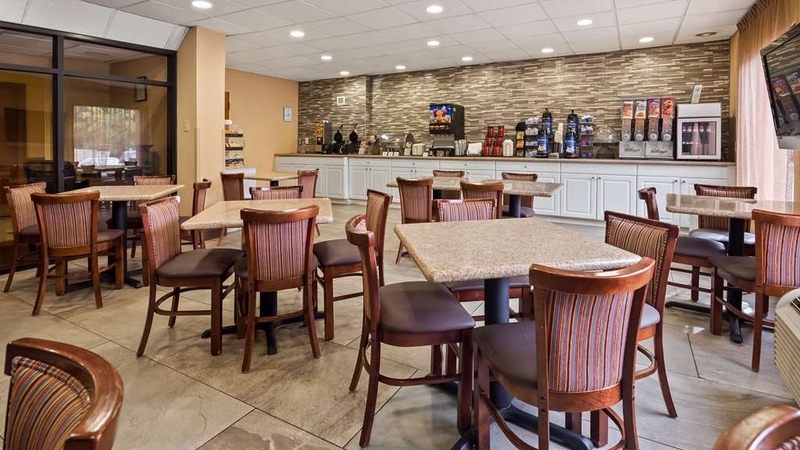 As for amenities: Breakfast is great...many choices and an excellent selection of hot options (scrambled eggs, sausage, sausage gravy, waffles, toast bagels) as well as fruits, danishes, and cereals. Although I am not much of a tv person, the cable service provided has great variety including HBO (I do not know if there are other premium channels). There is a laundry room located very conveniently on the second floor and it is always in perfect order. 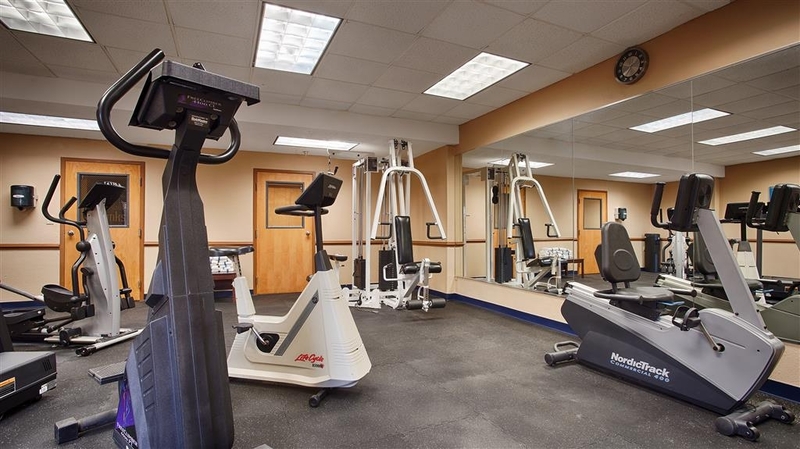 There is also an exercise room with all the basics you will need to get in a workout while you're away from home. Finally, the pool area and the pool itself are always immaculate. I want to add that this hotel is exceptionally quiet and low-key. Only twice have I heard any noise whatsoever from other guests, and it was not, by any means, exceptional. Most of the time, I wonder if I am the only person in the hotel, even when there are large groups staying. 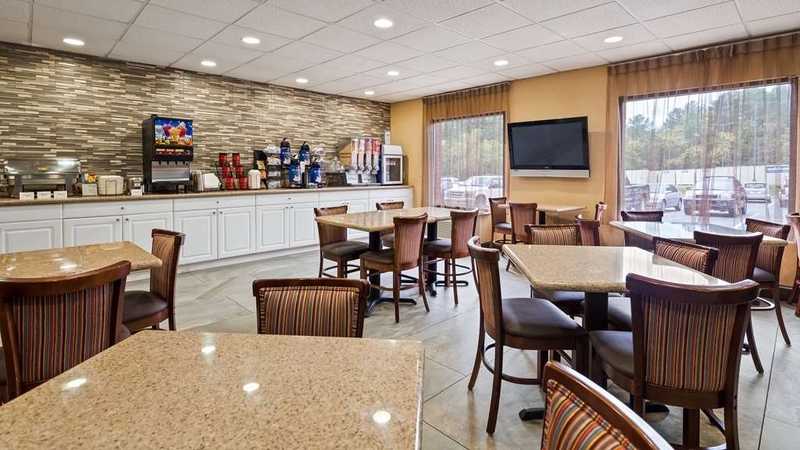 My opinion is that, if you want a reasonably-priced, peaceful, clean and convenient hotel in the Greater Richmond area, you could not do better than Best Western Executive. The staff is very friendly. The location is good. I enjoy the free parking and WIFI. The breakfast is very good. My only real issue is the Fitness Room. It desperately needs attention. It needs new working equipment and free weights. And there is never any cups for water or working wipes. "Don't stay there if you do not smoke!" AC/ heating system did not work. Smoking and non-smoking rooms are on the same floor. Breakfast was below average. Fire alarm went off in our room when we turned on the heater. Otherwise we were freezing. Shower was not hot and the beds have no real blankets. "Utilizing the comfort of Best Western Executive Hotel"
This was a great hotel. Staff was extremely friendly and location even better. I am elated to have this hotel added to my list of recommendations for clients as I am a travel consultant. The room was accommodating for having family visit, sit and enjoy the company of each other. "Great Service but needs a few things"
Safe, quiet location near food and shopping. Very helpful, friendly staff. Reasonable selection of foods for breakfast. Decent sized room with clean fixtures, but mattress was saggy and lumpy, causing me back pain. Public areas needed vacuuming and room badly needed dusting though floor was clean. This could easily be a top-notch motel with just a bit more attention to detail and a new mattress. I stayed here in the aftermath of Hurricane Matthew when my train was home was cancelled. This hotel is very adequate for a couple of days. The rooms are clean and spacious with coffee pots, good tv, etc. unfortunately the AC unit fan had only one speed -always on. Not too efficient. Also, the remote control wouldn't go "up". I'm sure they would have replaced it had I asked. We weren't in room that much. There's a great breakfast and free internet. Staff is very friendly. Also a good location on Broad Street. "Good Place To Lay Your Head At"
This is my second time staying at this property. Check-in process was smooth and very easy. The room was decent nothing spectacular. I would only use this hotel to where I would only stay one night I will have not been disappointed. "Outstanding service and compassion "
Stayed at this hotel and had a terrible experience. Drove in from out of town for a wedding and needed a place to change. Arrived 45 minutes earlier than the early check in time. Was told they would charge for early check in but I was only 45 mins early. Hotel reception was very unacommodating. They had extra vacant rooms at the time. Then when we checked in at the regular time, they put us in a room that had flooded the night before and the wet vacuum was still in there. It smelled of mildew. I had to go back to the front desk to request another room. The hair dryer in the new room did bot work. I had to call them twice to repair it. I needed it ASAP to prepare for the wedding reception. Breakfast room overcrowded. Overall a terrible experience. "Poor front desk service and HORRIBLE smoke odors"
I reserved a non-smoking room. Upon arrival, I was told I had reserved a smoking room, I showed my reservation and was given a "non-smoking" room on the second floor. Exiting the elevator, the hallway reeked of cigarette smoke which ultimately permeated the room which required me to stuff a towel under the door (which did no good). The walls in the room were gross. The bed was comfortable and the shower/toilet area seemed clean. Upon checkout, they had my rate wrong and said I would have to wait for the manager to come in to correct the problem, which was corrected, but just added to my distaste of this facility. Can't imagine how they have gotten the rating they have. I have stayed a numerous Best Western's but none so bad as this one. "Cigarette smoke odor was horrible"
The hallways reeked of cigarette smoke as if people were standing in the halls smoking. I was supposed to have a non-smoking room but the odor permeated the into the room and was unbearable. The walls in the room were filthy. The checkin-checkout staff got my reservation wrong at checkin and my rate wrong at checkout and told me they couldn't fix the invoice. I had to wait for the manager to arrive. It was ultimately fixed but the hotel was by far the worst one I have ever stayed in. Don't know how it got the tripadvisor stars that it did. My manager stayed in the same hotel and reported the very same experience with her room as well. Everything was quite satisfactory. The best part - quiet! We didn't even hear people in the hall, and the hotel was pretty full. The beds were comfortable, air conditioning ran perfectly, and the in-room amenities included a refrigerator, hair dryer, and coffee maker. The free breakfast was replenished as people came through. We will definitely stay here again. Reception and Breakfast staff very friendly and helpful. They were all talkative and charming to engage with. Being an Englishman in Richmond is definitely an advantage because they love the accent. Although, the hotel is quite far from Richmond city centre and you need a car to get anywhere. Warning to those who book on Priceline and similar sites-you will automatically get the cheapest room, which in this hotel comprises 'smoking' rooms. I didn't know that hotels in the 21st century would have such rooms, but they do. You can get into a non-smoking room for an additional charge. On the plus side, the breakfast is included and quite good, with waffles, eggs, yogurt, fruit, etc. Super hotel staff. Everyone was excellent here. This hotel is a little "tired" and my first floor room was a bit damp. The TV was snowy, but I was warned at check-in, so it was not a surprise. The TVs were repaired while I was there. Fair enough. The location of this hotel is important. It's convenient to everything from the Interstates to the suburbs. Several nearby restaurants offer discounts if you have a BW room key. If you are in Richmond for business, as I was, this is the place. If you want to enjoy yourself on a vacation or something... not so much. Price was right. We booked our stay last minute (literally, in the car, on our way) very late at night on our way home. The hotel's parking was a little limited upon arrival. The staff was excellent, though. Our room was fine, though felt a little damp. Breakfast was pretty varied, and our kids were happy. Checkout quick. We needed somewhere to stay while on a road trip. The Best Western at Richmond Virginia was well priced, clean, had all amenities, friendly staff and was good value for money. It was just what we needed after a long day on the road. 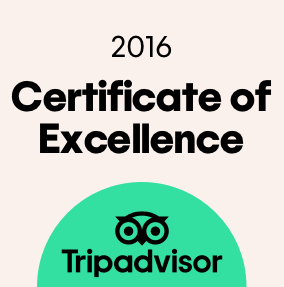 I don't know why I need to add 200 more characters to keep trip advisor happy - I don't have any more to say!!!!! Loved my stay at this hotel. The staff was super nice. Very clean comfortable beds. Breakfast was excellent!!! The lady who checked me in was very helpful in her knowledge of the area also. Great location!!! "Clean room, good breakfast, nice pool"
Stayed just one night on way home from the Outer Banks we arrived about 2:30 and was able to choose to stay in a room away from the smoking section which was nice. The bathroom and room were clean. My kids loved playing in the pool before dinner it was nice and warm and very relaxing. Big selection for breakfast sausage, eggs, waffles, make your own omelets,bread, danish, muffins, cereal, biscuits and gravy, oatmeal so they had something for everyone. Only things I didn't like was being in a connected room would rather have a little more privacy and the construction zone in the front makes it difficult to enter as the sign is after the entrance so we turned in the wrong location so had to go out and turn around again, drive is very narrow as its 2 way traffic. One elevator was broken but the other one always came fast and didn't have any issues with it. Stayed here for 2 nights en route from Virginia to Texas. Clean but could do with an update however, the staff was friendly and the breakfast was adequate. Plenty of restaurants nearby. Conveniently located near the freeway for easy access to 1-95 South and Washington, D.C. It was so so but too dusty not to clean the breakfast poor quality and the coffee horrible taste. The air condition was the only good thing about the hotel very cool. If you want to stay just for one night is ok but if it is for vacation more than a day look for another hotel even if you pay a little more. I really enjoyed this hotel. The only thing I left my shoes in room and when I called they said no one could find them. So had to buy another pair. I will say Susan is a delightful person. The best customer service I have seen in awhile. I will be coming back again and again. "EXCELLENT Customer Service and Very Nice Stayt!!!" Excellent Customer Service & Very Nice Stay! I had such a nice stay but meeting Cristina was the highlight! Her service is the type that will make u want 2 return just because! She displayed huge appreciation 4 me as a guest. From the moment I spoke 2 her re my reservation - she treated me as a valued customer. She is very pleasant & very kind & went beyond the call of duty 2 make me feel very special! l will never forget the EXCELLENT service that she provided. Best Western should be very proud 2 have Cristina as their ambassador. As far as the Hotel - it is clean and comfy! Even the shower bar was nice and clean! Ladies, u know that we sumtimes have 2 hang garments, well I checked the shower bar b4 doing so.....absolutely no dust/no dirt/no grime at all! Cleeean!!!! Impressive! Around the bottom of the toilet was clean, the tub and sink – spotless! Rug is nice & clean & appeared 2 have actually been vacuumed and/or shampooed. Face cloths and towels did not have old spots all over them - they were nice and clean. I normally will not use hotel towels or face cloths but didn't mind this time. Of course, can't leave out what's very important....bed was nice and comfy also. Oh yeah - They even have a disposal cover 4 their T.V. remote! Com' onnnnn! Koodos Best Western!!!!! Koodos! This was my first time spending a night at a Best Western hotel and I enjoyed my entire stay. The front desk was friendly and very helpful with my needs. The room was clean and spacious and in a good location. My breakfast was not the best choice but doable. I will be back to Richmond for a vacation and plan on staying at the Executive Best Western. My family and I took a 2 day vacation to visit Kings Dominion, on Friday 7/15/16, and I had checked the reviews for this hotel beforehand, but did not make reservations. We went ahead to Kings Dominion on Friday, and then went to check in at Best Western. Initially, Jaymeka informed us that there were no vacancies for a 2 queen room w/ microwave and refrigerator, only a couple of rooms w/ 1 king size bed, w/ no pull out sofa, ( we have 2 children ). I explained to Jaymeka that we had just spent the evening at Kings Dominion and were very tired, and I didn't really want to go and drive around Richmond looking for another place, since it was already 12:30 a.m. Jaymeka, out of the kindness of her heart, looked through the computer until she found a no show, and the room was a 2 double bed unit. Other than sleeping a little closer to my wife ( not a bad thing !!!! ), it was perfect !!!!! Jaymeka was so kind and professional. This sweet young lady deserves a raise !!!! The room was clean and neat, everything worked, and we got a good nights rest. If we ever take this trip again, I will stay nowhere else. 4 completely satisfied customers here !!!! I must also mention that Mitchell, who checked us out on Saturday morning, was clean, neat, kind and professional. A great vacation experience !!!!!! Hotel clearly needs a face lift and a thorough cleaning. Furniture was pushed in front of the adjoining room doorway which led me to wonder if the lock was working properly-- creepy. Carpeted floor was actually slimy. For what it's worth, front desk staff were lovely. Nice and clean rooms. Very friendly staff. We had several people staying here for a ball tournament in Glen Allen. Would stay here again if I had to. The night manager went beyond to welcome our stay. She had cookies and bottled water for everyone that stayed with us. She also opened the breakfast room a couple times for the boys to have a place to meet after games and for everyone to get together and have pizza. Thank you Best Western Executive Richmond VA! Terrible handling of the situation when my child cut his toe in their swimming pool. Nobody tried to clean the swimming pool from a sharp foreign object that cut my child's leg causing us to interrupt our vacation. We had been on road for a long time in a bad storm for most of it. Finding such a nice hotel with welcoming staff was a godsend! Hotel was clean, bed was comfortable and staff professional and friendly. Can't ask for more! Motel was conveniently located to I-64 which made getting Downtown and to other destinations we wanted to go to very easy. We opted not to have daily room service but housekeeping staff gladly exchanged towels/wash cloths for us. Breakfast selections were very good but might have been nice to alternate bacon/sausage daily rather than sausage all three days. If you are staying for 3-days or more, be sure to ask for the extended rate contract which was a nice savings! Construction in front of the motel made access sometimes difficult as we had to come in through a side street. We arrived early and we were immediately checked in. Super friendly staff throughout. Bedroom clean and spacious 1 huge bed. Fridge, microwave and TV. We will definitely be searching out more best westerns along the route. Outstanding experience, accommodations were perfect we had a tour bus of 56, the staff was well prepared the rooms were all prepared clean, we all had enough of everything. Breakfast was great. Not one compla from anyone in our our group. Hotel manager Susan Smith was the best in assisting in the preparations. All I can say is thank you to all the staff and stay there if you need a place to stay. Nothing but Great Comments regarding our stay. From the GM - Susan, to ALL of the staff, they made us feel more than welcome. 'Outstanding Cooperation with the Tour Lead'. "Bus group check in - NO Line" - They made a great impression upon us... Kevin N.
Excellent Facilities. Gracious service . The rooms were clean and the staff was friendly and cooperative they assisted with directions around the facility eating places for recreational activity The Breakfast service quickly fresh and a variety of choices are all types of diets and they opened promptly at 6:30 a.m.
Hotel was good, staff is wonderful. The rooms are small but clean. WI FI was poor, breakfast was very good. product selection excellent and dinning room was very clean and the staff very professional and helpful. "Comfortable room and excellent hotel staff"
I came to the Best Western late without a reservation and the staff worked to get me a room at a reasonable price. My room was clean and comfortable, and with soft and firm feather and down alternative pillows to choose from I quickly fell asleep. The room had a large refrigerator and microwave, and a large flat screen TV. I didn't have time to sit down for breakfast, but when I went down to look at it there were scrambled eggs and a waffle maker, things I don't usually see on a complementary breakfast. I had an issue accessing wifi but the staff helped me get the information I needed. I could only stay at this hotel for about seven hours due to my business trip, but it was pleasant and I wish I could have stayed longer. "Great stay! Very gracious staff!" Our trip started off very rocky but General Manager, Susan Smith had an answer for everything we needed. She and her staff was very gracious and always smiling. Whenever, I am back in Richmond we will absolutely stay at this hotel. "The kids loved the breakfast"
The room was as described. The staff was helpful and friendly. Check in was quick, as was check out. The room was clean and ready upon arrival. The breakfast was well stocked - waffle maker with toppings (fruit, whipped cream), fresh fruit, instant oatmeal, breakfast burritos (tortillas, eggs, salsa, onions, sausage) ... My kids were very happy with breakfast. I would've liked another pillow on the bed. Rated High for Customer Service and Quality of care for all individuals staying in your Hotel. I will recommend Best Western to all individuals having Disabilities and traveling with children. I was very impressed with the overall service and stay. "Great accomodations for a reasonable price"
Have stayed at this hotel twice in the past year. Both times our stay was very pleasant and the hotel staff very friendly and accommodating. Rooms are always clean, plenty of towels in the bathroom and the room and fridge cool when we get there. Love that you can book no smoking rooms, and always get a no smoking room! Only complaint is that the pillows are too soft for my particular liking, but no one else seems to mind! Front desk staff (especially Mitchell) is always smiling and helpful. Used the pool last summer, and it was clean and plenty of pool furniture. Very convenient location and easy to get to (once you figure out you have to go behind Sheetz to get there!). Wonderful selection of hot and cold foods at breakfast, plus the make your own waffle station. Best Western Executive Hotel on Broad Street in Richmond, VA had very comfortable rooms and helpful staff. The best rates were available when I booked directly with Best Western locally instead of via a third party. I liked that they opened for breakfast at lease 15 minutes early every day to give us early risers a chance to eat before starting our day. We were called to the Hospital in Richmond on an urgent basis- needed a hotel close to the hospital. Tamera at the desk was very caring and went out of her way to help us with a room and personal supplies since we came to the hospital with nothing. The hotel itself was very average- the breakfast was not up to par. But the fact that Tamera went out of her way to help us during a difficult time was very impressive. The beds were poorly made,no fresh bags for ice buckets,no drinking cups for ice,floor not vacumed,didn't leave extra roll of tissue,beds and rooms to small. I've stayed at other Best Westerns and they were great.I have other complaints will take them up elsewhere. Staff handled everything professionally, they were courteous but not at my best interest. This location was good for the family event my family and I attended. There was many restaurants and stores around the hotel, which allowed the adults to have options as well as the teenagers. My family and I really enjoyed our stay. Front desk staff were great. Breakfast room was small and poorly laid out. Coffee was behind entrance door so you can imagine the problems. We had some stains due to a spill and they were not changed , in spite of my note and money Kleenex ran out so we left the empty box on the sink and it was still empty when we returned that evening. We had to call. Bathroom was SMALL. you had to close door before you sat on toilet. Would choose executive suites right behind it next time. Hard to access from the address given as Broad street. "Very happy with stay! " My buddy and I stayed here weekend of the nascar race. I had to booked it online with a third party site and was given a smoking room with only one bed when I needed two. The manager, Susan, fixed it for me even though she didn't have to. The staff was friendly and the room was clean. If we come back for another race we're definitely staying here again! I booked this room from my stay at your property in Dayton Beach. The directions were right on, the staff were pleasant and helpful. I regularly stay at Best Western, and my experience at this site will not change my preferences. I will continue to seek Best Western properties..
"I stay here every time in area, management and staff very nice and helpful, plenty of restuarants and c stores close by"
On 4/11/16 I was traveling , really did not have specific plan on where I was going to stay but got out of meeting early and thought ok, if I drive on to Richmond I will be closer for Today, Called hotel and got Susan ( Mgr ) her comment was yes Mr Cooper we have a room that you like, hard to find this service. The unprofessional front desk booked me in a smoking room, and "claimed" that there were no other rooms available. After driving for 9 hours, I had to basically get back on the road for another 8 hours. They made no effort to resolve the issue, were rude, and I would never stay in a Best Western again. We stayed here for a night to go Christmas shopping the next day. The hotel was okay. It was clean but the furniture seemed worn. The bathroom needs updating. The breakfast closed early on a Sunday 9am. Overall it was a pleasant stay! Near everything including interstate. I had good impressions from previous reviews on the hotel. However, when I arrived I was disappointed. The fourth floor was extremely loud. The toilet was broken the entire weekend and was given a plunger to fix it ourselves. The room smelled like bleach and mold. "Amazing experience, like never before"
Amazing manager Susan, goes above and beyond to make you feel like a 5 star. Great team working there, always smiling. They care for you to have a great experience. Definitely coming back next time back. Clean Hotel, Staff very helpful, and great location for shopping. You can find anything you want within a few miles drive or walk on a sunny day. The hotel staff is more than willing to help and very courteous. My sons baseball team recently stayed here for four nights. After checkout and already on the road back to New York, my son realized that he left behind a bag of clothes and an envelope with money in it. He was quite panicked. We contacted the hotel and spoke with Mitchell who, within minutes, went to my sons room, found the bag and envelope, and called us back to confirm. The manager, Susan Smith, along with Mitchell, were so helpful in getting the package mailed to us. Customer service at its finest! Bathrooms are small, plastic shower insert. Got a wake up call first night at 4am that I didn't request. Paid $120 per night - expected a little more. Breakfast eggs seemed like they were made from a mix. Hallways had low drop ceilings that made the place seem old. The staff were friendly, courteous and efficient. Tired hotel decor. Need an accessible power outlet near the desk in the hotel rooms. Had to lie on the floor to stretch to the power outlet behind the TV cabinet so I could plug in my computer. 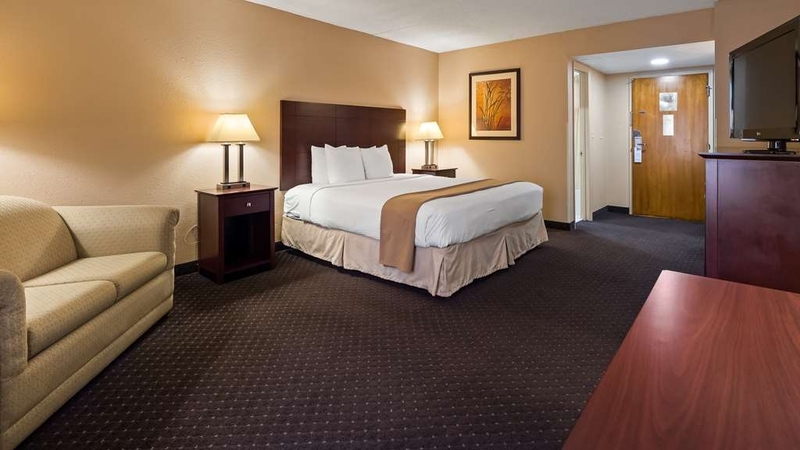 We choose Best Western whenever we can, because we know the beds are comfortable. True in this case as well, although the bathroom was quite small. We arrived around 6:30 pm and left at 7:10 am, so it was just a place to sleep on our journey home from Florida to Canada. Met our expectations as usual. Complimentary breakfast at Best Western is always very good. This is not a "high dollar" hotel, but, staff are the greatest, rooms are immaculate, breakfast bar well attended and the food is fresh! Also located in a great part of Richmond- convenient to everything- food, shopping, historical sites! "This place is a joke!!! "BEWARE""
Her name is Susan [--]and she is the hotel General Manager. I booked a room on Priceline and when I arrived, the Manager Susan [--]told me that I was assigned a King "Smoking" room and if I wanted a non smoking room, I had to pay the hotel $15 more to accommodate that request. Since when was a non smoking room an upgrade! All this being said and the hotel was near empty as this was on a weekday. I refused to pay, contacted priceline whom then contacted this her and she still refused to accommodate the request or cancel the booking. I immediately checked out a d informed her I would be gettimg my money back, she rudely stated I would not. She must not have known the type of customer I am. The type that will go all the way to Best Westerns Corporate Executives. I contacted them, explained what had taken place and what do you know.....I got my money back!!!!! Thus, I received the last laugh!!!!! "BEWARE" the hotel wasn't clean at all and it smelled of cigarettes thtoughout. Poor customer service + Poor management = a terrible establishment Do yourself a favor, look elsewhere before resorting to stay here. This hotel served its purpose for what we were in town to do. 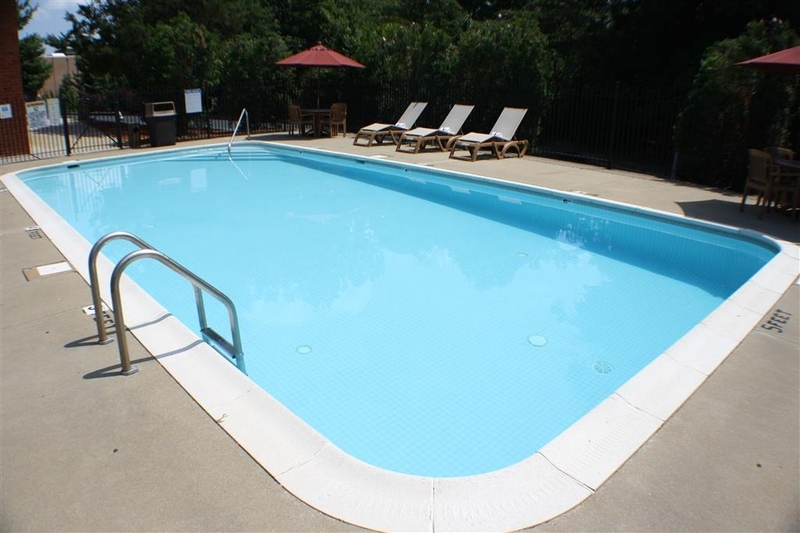 It was conveniently located with several restaurants and other services nearby. Rooms smelled smoky and renovations disrupted our stay forcing us to change rooms. The breakfast provided was satisfactory. For our non-holiday purpose, the hotel met our needs. "Not fit for an "executive""
When a hotel calls itself an "executive hotel," be suspicious. The Best Western Executive Hotel falls far short of digs that would satisfy an "executive"... or anyone looking for a quality hotel stay. Rooms are basic and dated, clean enough but not spotless. There are very few amenities. Wifi is free but excruciatingly slow. I finally gave up and used my phone as a hotspot. The front desk agent was pleasant, and I did get a good night's sleep. That said, there are many similarly priced hotels that provide a significantly better experience than the Best Western Executive Hotel. Not recommended. Stayed here with our team for a game at VCU. Hotel was very clean and the staff was very accommodating and friendly. The hotel was in close vicinity to VCU and many local businesses. This hotel is a great value for the price! We had four rooms for a family party for two nights over the President's Day weekend. Oddly enough they charge extra for early check in now. There was smoke in the first floor hallways - so - even though the rooms were non smoking, you could smell it every time you opened the door. The desk staff were great, The breakfast was great. 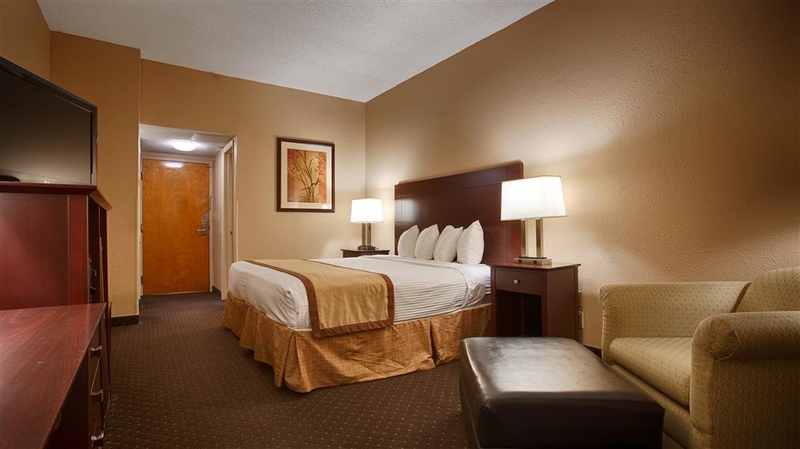 "Best Western Executive Inn, Richmond,VA"
Excellent hotel and easy access to major amenities. The rooms and breakfast were very good and the staff was excellent. Had no problems and the rooms were very nice. Great value for the money. would definitely refer family and friends. We had late arrival and checked in with no problems. Check in less than 5 minutes. Room nicely decorated and clean. Manager was very accommodating, all staff was friendly. Free WiFi and breakfast. Great place to stay. Front desk staff (Tamara) assisted me. She was friendly. Hotel rooms on the 4th floor have an order from the renovations taking place on the 3rd floor. Business center leaves a lot to desired. Sleeping rooms are just okay. Nothing great. Wouldn't recommend this place unless you had no other options. excellent staff accommodated all my needs. I would recommend this hotel to all of my friends and family. this hotel is where I would stay on my next visit. I visit this area bimonthly and have stayed in various hotel in the area I do not pick the hotel based on the price, I choose the hotel based on staff service and management. this hotel have accommodated me on late arrivals as well as other business needs. I booked this room for my husband and daughter as I was having surgery. Paid for it upfront and then called the hotel and confirmed. Was told yes I had a room with two beds (smoking) Imagine their surprise when they arrive( after 18 hours at the hospital) they no longer have this room and was given a so called upgrade with one bed non smoking. This was not an upgrade for them. They had to wait for the next day to see if one would become available that was paid for to begin with. They had to carry their stuff back to the car and carry with them. They were there 3 days before I was released. This is the second time this has happened to my family with this hotel group. You can bet I will not be staying with them again. Stayed here while visiting family. I love this place because it is mostly business travelers and it is quiet. No children running around. It is close to where we need to be for our family. I will use this place again. 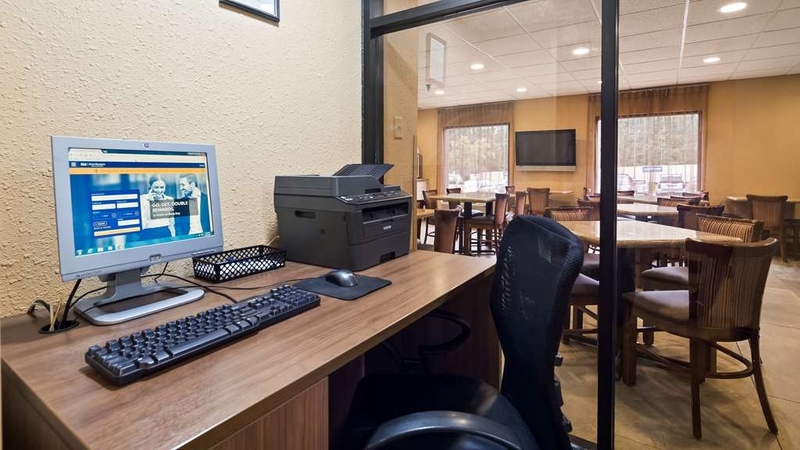 Hotel is located within a short driving distance from many restaurants and shops. A bit difficult to find if you don't know where you are going as the address is Broad Street but the access to the hotel is behind a service station on Broad Street. Room was clean and comfortable, but had visible signs of repair due to water damage in the ceiling. Bathroom was extremely small! Staff was pleasant and helpful. Breakfast was simple but adequate. I would recommend to business travelers as it meets your needs and is close to many businesses and restaurants. I would be less likely to stay here for vacation or pleasure trips. "excellent service at this hotel"
This hotel was in a very convenient location to 64 and several restaurants and not too far from the Richmond Raceway. The check in staff was very friendly and helpful. The breakfast was great in comparison to a normal free hotel meal. Would definitely recommend this hotel and will stay here again when next in the area. This hotel was moderately priced with reasonably good reviews so I gave it a try. The lady at the desk was the happiest desk person I've ever met and it immediately put me in a good mood. Knowledgeable staff. A "Fridays" out front and decent BBQ place across street. Good neighborhood. Place was clean, including bathroom/shower. Internet worked well. Breakfast was the motel average, scrambled eggs, waffles, juice. If I return to Richmond, I will return to this place. I've stayed at this property many, many times. I have always had a good experience. When I got there this time I was told I had a non-smoking room on a smoking floor. When I asked if there were other rooms avaiable I was told they were full. The hallways of this floor smelled terribly. Even though my room didn't smell of smoke, by the morning my eyes and throat were burning. Haven't stayed in a Best Western for awhile and probably will not anytime soon. Bed was not comfortable. TV channels were fuzzy. Walls were thin, as I could hear the neighbors arguing at 5 in the morning. Room keys were not working before check out time and maid was knocking on the door before the checkout. The hotel is a little hard to get to at first because the GPS made me do a U-turn then I missed the entrance. I found the second entrance at the light the next time. My only complaint was the smell of marijuana in the elevator and hallway. "Excellent hotel with hands on management"
This stay was our third annual meeting at this same hotel for a group of veterans. Hotel management went out of its way to show they cared about us and appreciated our service to this great country. The property itself was very good and well located in the area and provided a great breakfast. We will definitely stay here again and would recommend this hotel. The management of this property was second to none and they really made our stay feel extra special. Hooray, Best Western. "Stay somewhere else unless you're desperate"
The hotel is outdated and very gross looking. We were told our room wasn't ready 4 hours after check in began. They put us in another room with a broken tv and sticky liquid covering the walls. An hour after we checked in, I called to ask for another room and then one was ready to be moved into. The breakfast was disgusting. Only pros: comfortable bed and strong internet. Wow, loved this hotel. I got a King Suite for a great price. The room itself was super spacious, the bed was comfortable, 2 tvs..one in the sitting area and one in the bedroom. Clean. I got put by the elevator but really didn't hear much noise. Room had a microwave and fridge so you could do your own food if you wanted. Breakfast was great, plenty of options. I can't say enough about the value for the price. Free Wi Fi. I will most definitely stay here again when I am in town. Really a great stay. And plenty of restaurants around even in walking distance. Check in was a total breeze. Chose this facility because of its price point and its convenience to downtown and to the Inter-state(2 turns and you're on I-64). Ample parking. Easy walk to restaurants and eateries. As an over 65'er traveling alone, I felt quite comfortable. The staff was excellent; friendly and helpful. I'd choose it again. "Great Room at a Great Price!" As soon as we walked through the door, we were greeted with a pleasant smile and hello. Immediately took care of us and got us to our room. The receptionist even told us about getting 10 % off restaurants in the area just by showing our room key. He was extremely helpful. Even so much as we were having a problem with our nieces room. He sent up the maintenance guy to fix the door. Great service and a very impressive layout of food for breakfast. Best Western has sold me. I will certainly use them more often. We stayed at this Best Western hotel from 10/8-10/11/15. This hotel had everything we needed, including price, and the location. Close to many restaurants, banks, and universities. Room was a bit small, but immaculate. If there is a complaint ... pillows. Way too small, but the Front Desk Staff (Tamara was absolutely a gem), provided extras. The breakfast room was also small but surprisingly, could accommodate everyone, and the lady staffing this area kept everything refreshed. No bad "hotel" odors, sufficient and safe parking. Wonderful stay ... will stay here again. From the moment I arrived after a long 2 hour drive from Leesburg, VA I was greeted with a warm friendly welcome from Susan at front desk. Susan and her staff showed me what warm southern hospitality is suppose to be. The hotel is well kept and my room was very comfortable. 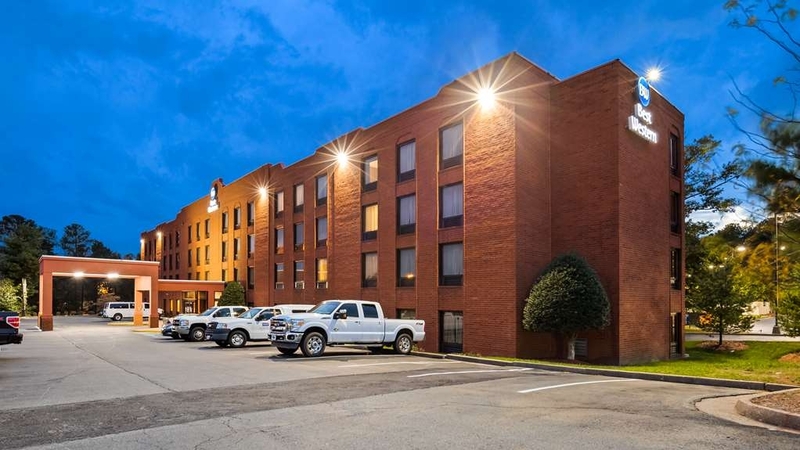 It may not have all the bells and whistles of some of the upscale hotels but I would trade all that to stay in a warm and friendly atmosphere like The Best Western Executive hotel in Richmond VA. Kudos to Susan and her team because they could make staying in doghouse during major storm enjoyable because of they're warm honest to goodness caring people. Thank you! I stayed here on 10/01/2015 to 10/02/2015 and I loved it :) My Kind bed non-smoking room on the 4th floor was simply amazing. It was very clean and the design was perfect and elegant for the price. The breakfast is delicious and the amenities are great! 5 stars BW! I'll be back for the low price and relaxation! We had no problems. The staff were very friendly and helpful. The place is not new but it is clean and for the price a good place to stay. They serve a continental style breakfast with a large selection to choose from and while it's not 5 star it definitely fit our needs for price, comfort and location. I would stay here again. Nakeea, We are sorry that we did not meet your expectations during your stay. Your satisfaction is important to us and providing feedback about your stay assists us in implementing improvements to ensure all of our guests have a wonderful experience. I have personally inspected the room you were in and have made sure that room has been corrected of all maintenance issues. Additionally I have made sure the room has been deep cleaned. We want to offer you our deepest apology and we hope you give us another chance to provide a better experience for you in the future. I am always available for my guests, so please fell free to contact me at [email protected] if I can assist you in any way. "Fantastic stay for the price"
Everything about this hotel was perfect for my needs: kind, courteous, quick staff, comfortable beds, perfectly working air conditioning, quiet rooms, hearty breakfast, speedy checkout. The staff lightened the mood when we were checking in and they could tell we were exhausted, they had recommendations for the area if we wanted to eat out, and they were responsive to all of our questions. Would absolutely recommend this hotel!